The awesome ladies of Holistic In The City (my nutritionist girlfriends) and I got together for a potluck this weekend. The food, as per usual, was delicious!!! I decided to test out a new recipe, as I’ve been wanting to make a zucchini noodle salad, and this one turned out really well. 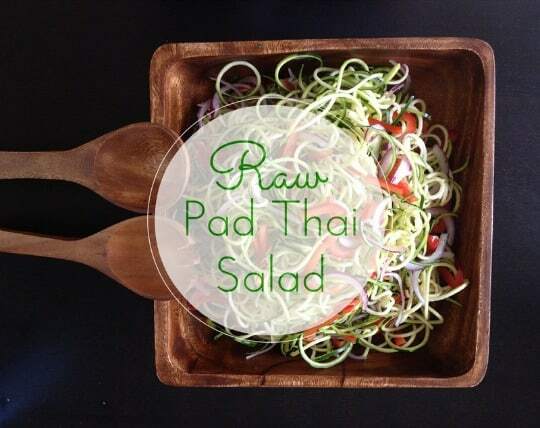 I like to call it raw pad thai, because it has a very similar taste! 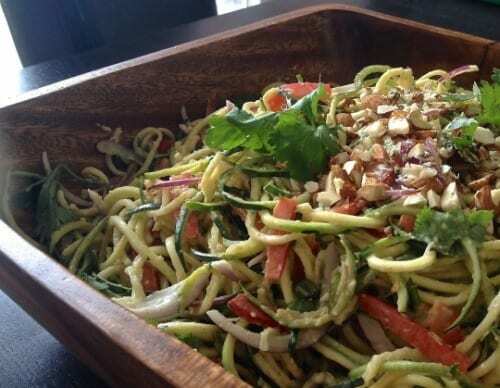 This salad does not have an ounce of anything bad in it and is full of healthy ingredients like: garlic and red onion (immune boosting), ginger (anti-inflammatory), zucchini (vitamin C), red pepper (vitamin C), and almond butter (calcium). The best part of this salad is it takes about 20 minutes to make. Oh, and it’s gluten free, dairy free, raw, vegan and everything else under the sun (it does have nuts though!). You are going to need some sort of vegetable Spiralizer for this recipe. This is the one I use, and LOVE, and you can get it on Amazon. My recommendation to you to ensure the noodles aren’t soggy is to put the dressing on the salad about 30 minutes prior to serving. Spiralize the zucchinis into a large bowl. Mandy King is a Holistic Nutritionist and Gluten Free Guru who shares her expertise with She Does The City. For recipes and nutrition tips, visit her website, HEAL. Follow Mandy on Twitter@mandyking_HEAL. Like Healthy Eating and Living on Facebook here. You can also find Mandy on Pinterest and Instagram.